I'm sorry to say that even though I really wanted to do Sharon Boggon's Take A Stitch Tuesday project through all of 2012, I ended up getting behind and then just sort of dropping it. Even though I visited the site to see the new stitches each week, I didn't manage to follow along after less than half a year had passed. That said, I still enjoyed the time that I did spend on TAST, and I'd definitely recommend it if you'd like to improve your embroidery skills. 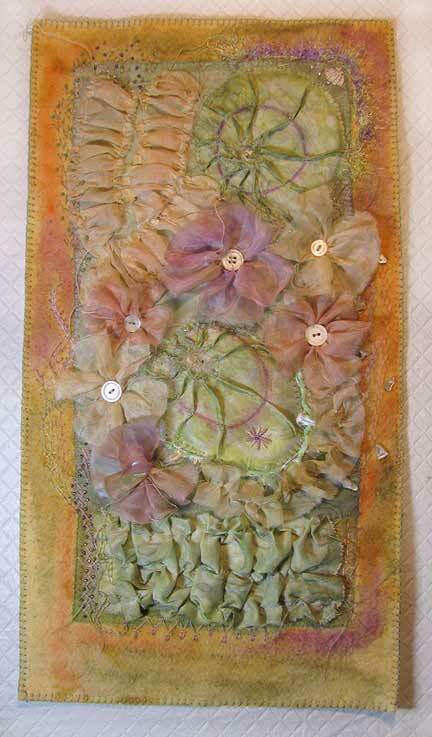 I posted information and some tutorials on Mixed Media Artist about the construction of the quilt top, including the manipulated fabric pieces. Some of the stitches included beads, others didn't, but I thought I should post this here just to finish off my planned series. If you'd like to see links to all of the stitches I added, they are under the label TAST.